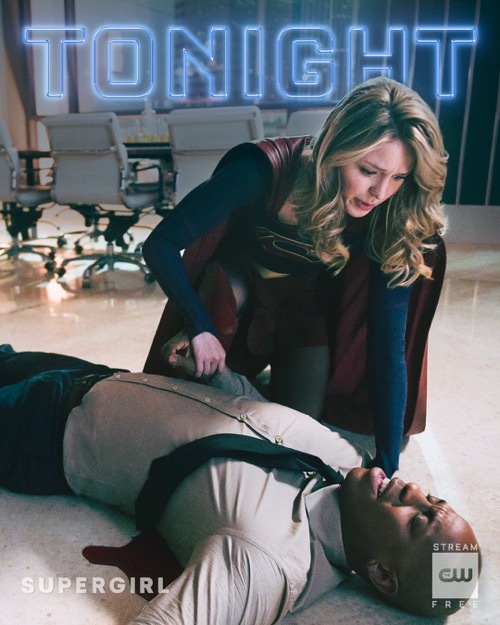 Tonight on the CW the series Supergirl airs with an all-new Sunday, March 17, 2019, season 4 episode 15 and we have your Supergirl recap below. On tonight’s episode called, “O Brother, Where Art Thou?” as per the CW synopsis, “Secretly furloughed from prison due to failing health, Lex Luthor visits his sister, Lena, to seek her help finding a cure. So make sure to bookmark this spot and come back between 8 PM – 9 PM ET for our Supergirl recap. While you wait for the recap make sure to check out all our Supergirl news, spoilers, recaps & more, right here! Tonight’s Supergirl recap begins now – Refresh Page often to get the most current updates! Lex shows Lena the view from their office of chaos living under a red sun. Lena pleads with him but he doesn’t care. He wants the world to learn that Superman isn’t a hero just a false god. The police rush in and take Lex away. Later… Lex arrives via helicopter after having a stroke. He is set up by medics and police in the house. They are letting him come home because he cannot run. He is dying. He is weak and feels pathetic. Lena’s assistant comes running in. It is James. They rush to the hospital. Lena learns that James has been shot. He is in surgery. Alex, Brainy, Kara and the others are all there. Alex tells Lena while they are alone that she should use her serum on James. Meanwhile, J’onn has found Manchester. He and Supergirl leave the hospital to track him down. Supergirl and J’onn find Manchester who taunts J’onn about being a man of peace. Meanwhile, Lena asks Lex to team up with her to save Jimmy. Lex thinks this is all very funny given it is Superman’s best friend. Nia tells Brainy at the hospital that her dreams are failing her. Jimmy’s sister shows up as they tell Alex and the others that Jimmy is in a coma. Lex is having trouble breathing. A DOC worker drops the meds he needs on purpose as Lena and Lex work in the lab. Lena is angry. After stepping out to talk to her assistant in the hall, she returns to find Lex on the floor. Jimmy begins to code. The doctors rush to intubate him. He is bleeding internally. They think he needs surgery. Alex pulls Jimmy’s sister aside and tells her about an experimental drug Lena is working on. She only needs a few hours. Jimmy’s sister doesn’t like the sound of any of this, putting his life in Lena’s hands. Lena and Lex work to perfect the meds for Jimmy. Later, Lena learns Jimmy is in surgery. His sister didn’t want to wait for the drug. Lena is upset. Lex comforts her, telling her about her mother and how she always brought the light as does Lena. He tells her to go and see Jimmy who needs her. J’onn has a nightmare of a dead Alex and Kara. They taunt him, telling him he didn’t save them like he didn’t save his daughters. He begins to scream when Kara brings him back to reality. Kara shows up at the hospital. Alex has been mad she has been missing for no reason, unaware that she is Supergirl. Meanwhile, Brainy is upset over all that has been happening. He starts to ramble but stops when Nia kisses him. The lights flicker. J’onn and Supergirl realize there is a surge with the power. It is Manchester. They rush to him as the lights and generators go down in the hospital affecting Jimmy’s surgery. Alex tells Jimmy’s sister that the serum is ready and Lena can save his life. Jimmy’s sister agrees to it. Terrorizing J’onn, Manchester shows him his children being killed. Angry, J’onn takes Manchester out and gets Brainy’s ring back. Supergirl appears, asking where Manchester is. J’onn doesn’t answer but suggest they go see Jimmy. Lena injects Jimmy with the serum. Hours later, he is alive and well with everyone visiting. J’onn is upset with himself, telling Kara at the hospital how he doesn’t feel like a man of peace. Lena realizes that Lex was behind the power outage. She confronts him. He admits that he also had Jimmy shot. He needed to test the serum on Jimmy before he tested it on himself. She tells him she will never give him the cure, but it is too late. Lex stands on his chair. He already took the cure. Lena’s assistant arrives. She had been helping Lex all this time. He has his men strap Lena to the chair.